On Palm Sunday we will begin our commemoration of the last week of Jesus’s life on earth. It is a week of extraordinary importance for Christians, the most sacred time of the Christian year, “Holy Week.” And, while Easter Sunday is the culmination, a day of celebration for the Christian world, it is through the day-by-day observance of Holy Week in its entirety that we realize and appreciate the full meaning of the death and resurrection that it represents. Palm Sunday, April 14 10:00 a.m. – Walk with Jesus and his followers as he makes his entry into Jerusalem, and experience a dramatic Readers’ Theater telling of the Passion of Christ. Maundy Thursday April 18 – Share an evening Agape Meal (6:00 p.m.) with Eucharist (7:30 p.m.), followed by the traditional Last Supper foot washing and the somber stripping of the altar. Good Friday April 19 Noon– Experience a subdued noonday observance of the Passion. 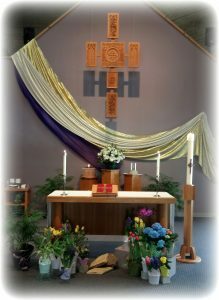 Easter Vigil April 20 8:30 p.m. – Witness an updated Liturgy of the Light, hear the Liturgy of the Word, participate in the Holy Eucharist and a jubilant proclamation that Jesu s lives! A true immersion in the Holy Week experience requires that we journey from Palm Sunday to Easter Sunday without skipping anything in between. How will you experience Holy Week?